Light vs Dark. Good vs Bad. Red Sox vs Yankees. Angels vs Demons. There has always got to be a Ying against the Yang and that is the case with the new Gabriel Angel 5inch Kidrobot Dunny by J*RYU, a wonderful counterpart against the Azazel Demon Dunny by JPK released last year. Gabriel Angel is all set for a release into the Designer Toy ethos this week, and TTC got their mitts on this awesome new Dunny early to take some pictures. Check it! 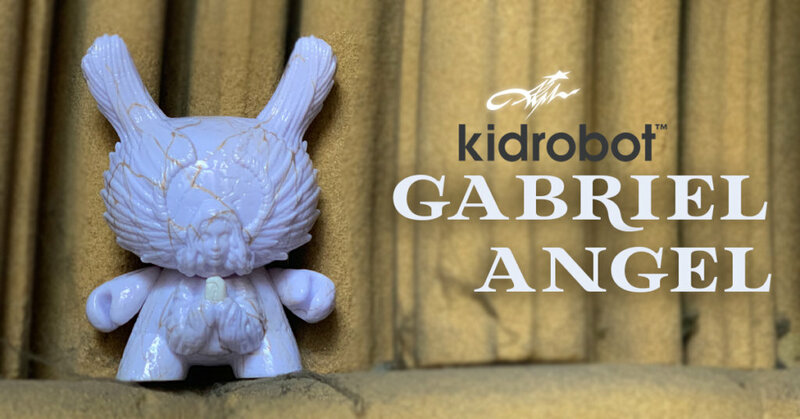 Gabriel Angel Dunny will release on Friday 1st February (tomorrow) from the Kidrobot online store HERE, limited to 1000 pieces. Dropping at 10am MST (5pm GMT for us in the UK). Price will likely be $49.99 (£38). We expect to see at least one different colourway tomorrow, exclusive to Kidrobot – we shall see. Other retails that will stock Gabriel include, myplasticheart and Strange Cat Toys. As we mentioned above, Gabriel Angel is paired with the previously released Azazel Demon Dunny by JPK, which released last September. Both are part of the award winning Arcane Divination Dunny Series that released in 2017. With the upcoming Arcane Divination Series Two coming in 2019, you can check out more details on this series HERE. You can read our review of the Azazel Dunny HERE. Check out the pictures below of Gabriel with Azazel. We are super excited to see both the Gabriel Angel & Azazel Demon Dunny together ever since we got hold of the Demon Dunny. They are both magnificently crafted Designer Toys that look great together. Don’t miss out tomorrow. 10am MST (5pm GMT) at Kidrobot.com!